We continue our Presidential Geography series, a one-by-one examination of the peculiarities that drive the politics in all 50 states and the District of Columbia. Here is a look at Washington, the Evergreen State. FiveThirtyEight spoke with Mark A. Smith, a professor of political science at the University of Washington. In presidential elections from the early 1880s through the mid-20th century, Washington was a swing state, even slightly Republican-leaning. 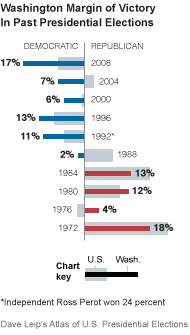 In 1980, Ronald Reagan over-performed in Washington relative to his margin of victory in the nation as a whole. After that election, however, the state’s partisan makeup began to shift. Washington voters began to move — and fairly quickly — toward the Democratic Party. Reagan carried the state again in 1984, but he underperformed his national popular vote by four percentage points. By the 1988 election, Washington had been transformed. It was nine percentage points more Democratic-leaning than the nation, and George H. W. Bush failed to carry it. Washington has been reliably blue ever since. “Democrats had about a 10 point shift in their direction in about a decade,” Mr. Smith said. The rapid political change in Washington was fueled by the rise of cultural conservatism in the Republican Party — the same dynamic that turned the South deep red and pushed Northeastern states like New Jersey, Delaware and Connecticut into the Democratic column. “Washington was a socially liberal state,” Mr. Smith said, “and as the social issues became more prominent on the national scene in the 1980s, that social liberalism pushed the state more towards the Democratic side,” Mr. Smith said. In particular, Washington has been progressive on women’s issues.1 It was early to embrace women’s suffrage (in fact, women temporarily gained the right to vote in territorial Washington). In 1926, Seattle elected the nation’s first female mayor of a major American city, Bertha K. Landes. Washington also elected one of the nation’s earliest female governors, Dixy Lee Ray. Washington is still taking a leading role in female leadership. For the last eight years, Washington has had a female governor and two female senators, the only time in the nation’s history that a state has had women in all three offices. Given Washington’s position on women’s rights — it was one of the first states to liberalize abortion laws — and its status as one of the least religious states, it is no coincidence that as abortion became a driving national issue, the Evergreen State over all became more Democratic-leaning. 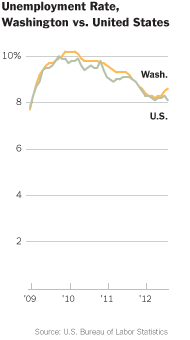 But that realignment has been limited to Washington’s urban and suburban areas. Washington’s political landscape is similar to Oregon’s: a populous and liberal west; and a rural and conservative east. The divide in both states is stark and driven by some of the same issues. Washington’s population is clustered in and around Seattle, which has seen an influx of well-educated voters drawn to work in biotechnology firms in towns like Bothell and to jobs with Microsoft in Redmond. Seattle is one of the most liberal cities in the nation, home to young, single professionals and one of the country’s largest gay communities. Seattle’s King County is also one of Washington’s most diverse areas; it is 15 percent Asian, 9 percent Hispanic and 7 percent black. Although Western Washington is Democratic-leaning, there are some nuances. 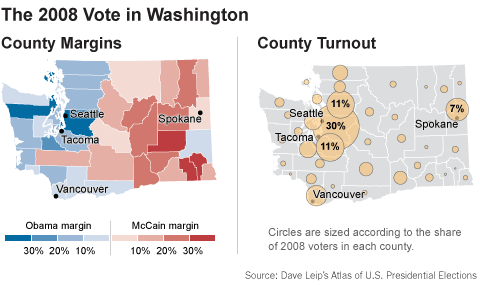 Southwest Washington, for instance, is more politically balanced than the Seattle area. The Olympia area skews liberal. But the fast-growing Vancouver area, just across the state line from Portland, Ore., is close to politically even. Vancouver’s Clark County is home to many tax-conscious conservatives, who came to income-tax-free Washington but settled close enough to the border to shop in sales-tax-free Oregon. Traveling east, the Cascade Mountains mark the transition into majority Republican Washington, where the economy is based much more on the land. Central Washington, just east of the Cascades, is the most rural and conservative region of the state, Mr. Smith said. In south-central Washington, much of the nation’s apples and hops are grown in the Yakima Valley. As you travel farther east and reach Spokane, population density increases, but not to Seattle-like levels. Republicans are a majority, but a less dramatic one compared to central Washington. Anchored by Everett, where Boeing has a large plant, Snohomish County is “far enough away from the urban core to become somewhat less liberal, but not out in a rural area that becomes conservative,” Mr. Smith said. Accordingly, it has been an almost exact barometer of Washington’s political mood in the last three presidential elections. Snohomish County was just one percentage point more Democratic than the state in 2000 and 2008, and it matched the statewide vote perfectly in 2004. Despite the similarities between Washington’s and Oregon’s political landscapes, Washington is at least slightly more Democratic-leaning. 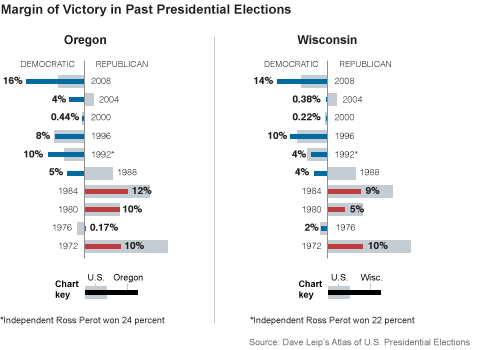 Oregon has seen some close presidential races in recent years; Washington has not. In this year’s race, President Obama is a 99 percent favorite in Washington and a 98 percent favorite in Oregon. That is obviously not a big difference. But Mr. Obama has a 12 percentage point lead over Mitt Romney in Washington in FiveThirtyEight’s adjusted polling average. In Oregon, Mr. Obama is ahead by 6.5 percentage points. In both states, political preferences along the Pacific Coast tend to outweigh the ideology of those inland. But in Oregon, it is a closer contest (if not exactly close). Eastern Washington, with more than half the state’s land, still casts only about a fifth of Washington’s votes. That’s less than Seattle’s King County, which alone accounts for almost a third of the statewide vote. Washington’s population distribution and cultural progressivism, particularly on women’s issues, combine to make it very difficult for Republicans to compete in statewide races. 1: Although cultural issues have moved Washington into the Democratic column, the state is still relatively conservative on fiscal issues. Washington has no income tax, and has rejected one at the ballot box several times. In 2010, voters rejected a ballot proposition to impose a 5 percent tax on income over $200,000 and a 9 percent tax on income over $500,000 by 30 percentage points.